Rent villas and apartments in Slano, Croatia. Book affordable holiday rentals that are near a beach. This beautiful holiday house in the village of Slano is a perfect choice for two or more families. It consists of two apartments that are connected via an external staircase. Nice holiday apartments by the sea in Slano, ideal for a beach holiday. CDD552 is located on the second floor (minimum ceiling height 160 cm),while CDD619 and CDD620 strech on the first floor. This spacious holiday apartment is located in the tourist town of Slano, just a very short distance from the sea and the beach. With four bedrooms, spacious living room and kitchen. Enjoy the real seaside holiday offered by small place Slano, situated on the famous Dubrovnik Riviera and by this holiday house near a beautiful pebble beach. This spacious terraced holiday home is situated in the small coastal village Sladenovici, near the sea. It is perfect for the holiday of two families with children as it comprises four bedrooms. 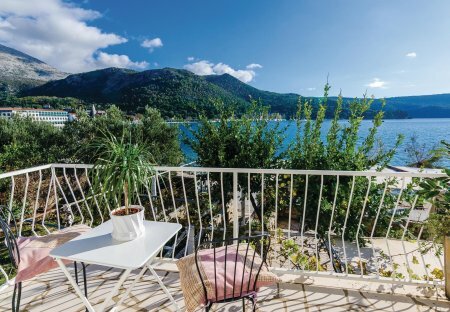 This comfortable holiday apartment in Slano is perfect for all who love to listen the sound of the waves because it is located close to the sea and beautiful sandy beaches. This original Dalmatian terraced stone house is situated in direct proximity of a beautiful pebble beach and is ideal for holiday of a family who want to run away from their everyday life and enjoy. Spend a pleasant holiday in this small holiday home, which is located in a unique location, only a few steps from the sea, in a small place of Sladenovici. The house consists of a bedroom. This is a bright new Mediterranean Villa, which will bring a positive feel to guests' holidays. The Villa has a lovely sea view! These simple yet functional holiday apartments are situated in a small picturesque seaside settlement Slano, whose coast adorn numerous pebbly beaches. Magnificent 4**** semi-detached, 3 bedroom Villa with lovely sea view!